The Clam Boulder looks like a shellfish. 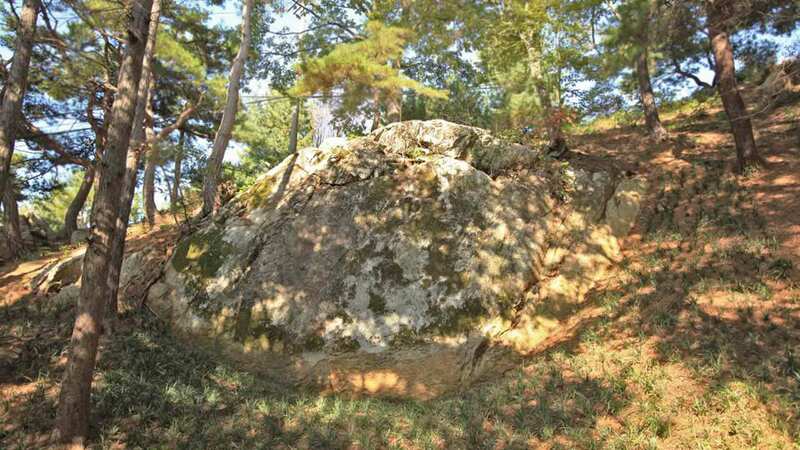 When Pastor Jung Myung Seok first saw the Clam Boulder, he didn’t try too hard to name it. Because of how it looked, it was obvious. When you look up at it, the word ‘clam’ rolls out of your mouth. We ended up shouting, “It’s a big clam!” because of how big it was. It is an expensive shellfish that is holding a pearl in its mouth. Whether a rock is small like a pebble or large like a boulder, it should be shaped like something. Then people will consider it valuable and a work of art. The Clam Boulder was hidden so that not just anyone would be able to see it. Even if you go to Wolmyeongdong, if no one teaches you about it, you will not know about it even after ten years pass by. If you go over the mountain and the grove of trees to look at the Clam Boulder, it looks as if the mountain is a rock and a shellfish is attached to it. When you go to China, you can visit up to 1300 places that are famous and beautiful. There is one particular boulder which isn’t that big but rises up quite high. Right next to it is another boulder. Surveys show that tourists come to this place the most, more than any other of the 1300 famous tourist locations in China. In 2004, UNESCO designed that whole region as part of the Global Geopark in China. The reason is because the outskirts were developed while centering on those two rocks. You should go and see at least once. A name will slip off your tongue when you see those two rocks. at the Yang (Male) Rock. There was a time when one woman went there determined not to let the rocks surprise her. But she collapsed onto the floor because the rocks surprised her even more. You should go visit and experience how shocking it is for yourself. If ornamental rocks have even one form, then their value will soar into the sky. What kind of form something has is important. This applies to people as well. God, Jesus, or the Holy Spirit are human masterpieces. A work of art that contains the love and heart of the Lord is considered a masterpiece regardless of how much time passes.